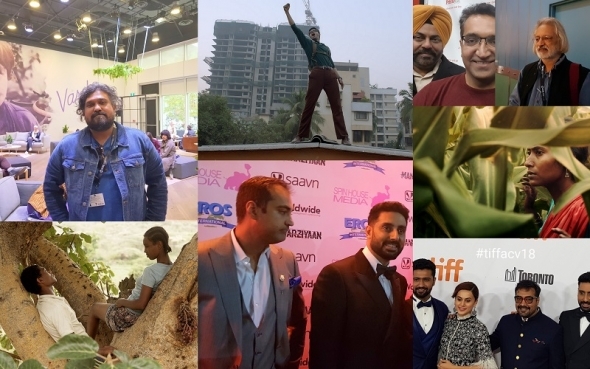 SANDYA SURI’s film, ‘The Field’ which also comes to London Film Festival (October 10-21) next month scooped the best short film award at the Toronto International Film Festival, which officially drew to a close on Sunday (September 16). The filmmaker receives $10,000 courtesy of the sponsors, watchmakers IWC Schaffhausen. Suri spoke to acv earlier this year about a film she made for the BFI. Bala’s Midnight Madness winning film, ‘The Man Who feels no pain’ is funny, entertaining, and extremely well executed. A fan of the Kung Fu genre and with a more than a solid grounding in both Indian and western B-movie aesthetics, the director of the hard-hitting and authentic ‘Peddlers’ has produced a movie with much charm, verve and much humour. It deserves to be widely seen and will almost certainly become a cult classic. It’s win as the best of the Midnight Madness selections is not a shock. It was the first film from India to ever appear in such a TIFF category. Bala talked to acv in Toronto, about only his second film and why he wanted to make a step change from what he had done before. The interview should be out later this week. ‘Green Book’ is the tale of a gifted black musician and his white Italian American chauffeur and set in the 1960s. It is inspired by the true story of Dom Shirley, a Jamaican immigrant who goes onto carve out a particular genre defying space as a pianist between classical, jazz and popular music. But Shirley, played by Oscar winner Mahershala Ali, just can’t pitch up anywhere in the south without facing segregation laws and discrimination. Viggo Mortensen plays his tough, and not always on message, chauffeur – expect this movie to pick up some Oscar nominations now it has been earmarked as an audience favourite. Aäläm-Wärqe Davidian takes home $30,000 for her prize. “‘Fig Tree’ is a stunning and illuminating debut,” the jury remarked. “Based on her own experiences, Ethiopian-Israeli writer-director Aäläm-Wärqe Davidian takes us on an unsentimental journey and shows us the tragic effects of civil war on ordinary people. Confidently directed with grit and compassion, ‘Fig Tree’ is a beautifully rendered, big-hearted story about a Jewish teenage girl’s attempt to save those she loves, but it’s also an intimate coming-of-age story of self-discovery and female empowerment,” commented the jury. One of the world’s great documentary makers was in town too for his latest film, ‘Reason’. Anand Patwardhan is like the liberal conscience of India and he delves into a spate of murders of left-wing activists. In an interview with us, he also discusses some highly provocative inconsistencies around the Mumbai attacks which occurred outside the Taj Hotel on 26/11/2008.